Jewish Defense League Chief Arrested in L.A.
LOS ANGELES (Reuters) - The chairman of the militant Jewish Defense League and one of his followers have been arrested in an alleged plot to bomb a major Los Angeles area mosque and the office of a California congressman, among other targets, federal officials said on Wednesday. 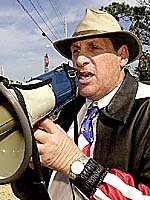 JDL Chairman Irv Rubin and group member Earl Krugel, who were arrested at their homes on Tuesday night, were charged with conspiring to bomb the King Fahd Mosque in Culver City, a Los Angeles suburb; the offices of Southern California Congressman Darrell Issa, the grandson of Lebanese immigrants; and the Muslim Public Affairs Council office in Los Angeles. Officials said the two men plotted with a third to make and detonate bombs. The third man, who was approached last October informed authorities of the plot, officials said. No bombs were detonated and no one was injured. A complaint against the two men said that Krugel told the informant the bombings were necessary because "Arabs need a wake-up call." The complaint added that the unnamed source was asked to help purchase bomb components and that Krugel said he would build the bombs at his residence. The source would then place the explosives. The source told officials that one bomb was to be placed in the offices of the Muslim Public Affairs Council. Rubin and Krugel are expected to appear in court later on Wednesday when bail and future court dates will be set. A relative of one of the men had earlier told reporters he thought the arrests were connected to the 1985 assassination in Santa Ana, California, of Alexander Odeh, regional director of the American Arab Anti-Discrimination Committee. Odeh was killed when he opened the door to his office and a bomb exploded. The night before he had appeared on television defending the Palestine Liberation Organization. A $1 million reward was offered in 1996 for information leading to the discovery of Odeh's killers. Rubin has said the JDL played no role in Odeh's death, but added he shed "no tears" over the slaying. The JDL was founded by Rabbi Meir Kahane, who was assassinated in New York in 1990. Prior to his death he founded the extremist KACH party in Israel which advocated the expulsion of all Arabs from Israel and Israeli-occupied territories. The party was later outlawed.